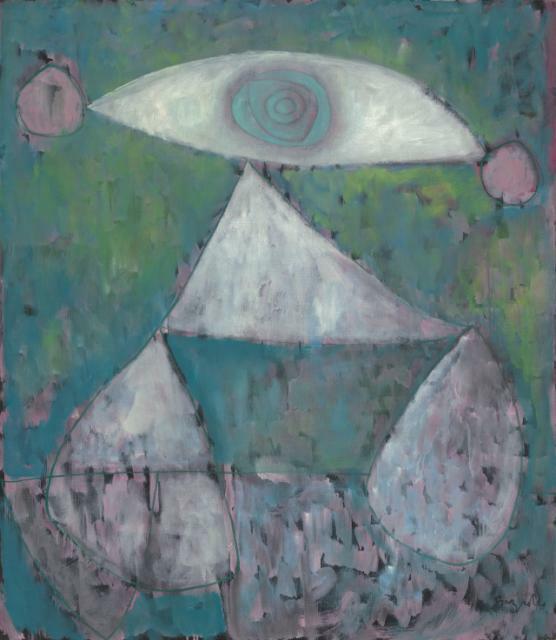 By the time William Baziotes painted Pierrot, he had become active in the Surrealist circles in New York centered around Chilean émigré artist Roberto Matta. A regular at Matta’s studio, Baziotes joined his colleagues Robert Motherwell, Jackson Pollock, and others, in making drawings using the method of automatic writing, a hallmark of Klee’s practice. As a Museum Assistant at The Phillips Collection, one of the questions I hear most frequently from visitors is, “Where do we start?” or “What is the order?” I enjoy the moments when I am able to have a conversation with a visitor about why a Blue Period Picasso and a classic Degas ballet scene, or some O’Keeffe leaves and an Imogen Cunningham photo, hang together—and why they work so well. Following the vision of founder Duncan Phillips, America’s first modern art museum takes an unorthodox approach to displaying its collection. As explained on the Phillips’s website, “Art from different eras and places is often juxtaposed and changes often to suggest visual ‘conversations’.” Even for patrons who are well-accustomed to museums and galleries, this approach may initially seem off-putting; but I frequently find that it leads to greater appreciation of the subtleties of particular pieces, and to the discovery—or deeper understanding—of connections among artists, styles, and works. The current exhibition, Ten Americans: After Paul Klee takes an approach that is simpatico with this “conversational” approach. 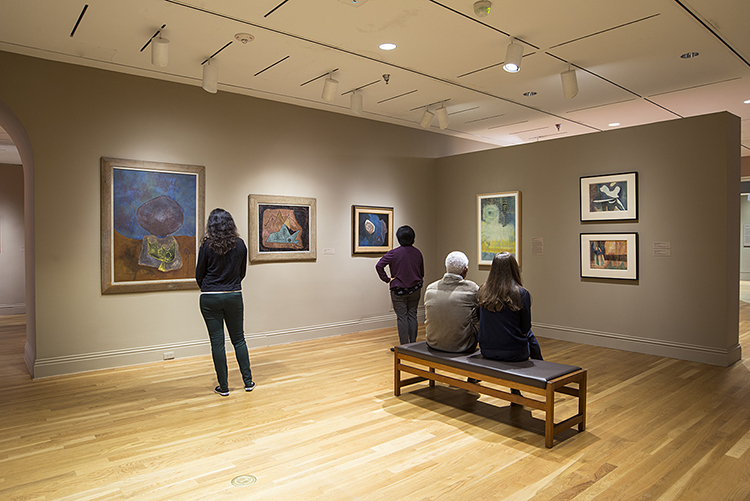 Rather than grouping the works by artist or chronologically, each gallery introduces an important theme or concept that influenced Klee and his artistic disciples, allowing the paintings themselves to demonstrate the meaning and impact of these abstract discourses. It is worth noting that the four themes explored in the exhibit are fluid in the sense that they overlap conceptually and—most importantly—that a given work in one section can easily be viewed through the lens of a different concept. One section of the exhibition, entitled “The Nature of Creation: Making the Invisible Visible,” beautifully represents the impact of grouping works by theme. In addition to the vibrant, undulating shapes of Klee’s Triplet Blossoms and the Cave, the gallery features works by William Baziotes and Theodoros Stamos, unified by the repetition of rounded organic forms. Each painting seems to have one of these circles at its heart, often with lines or other elements radiating from it calling to mind a cell, a seed, or perhaps a sun or planet, around which the rest of the painting’s energy and elements seem to revolve and flow. Stamos’s works often evoke ancient mythic cycles that link themes of creation, destruction, and rebirth with organic forms and biological processes. 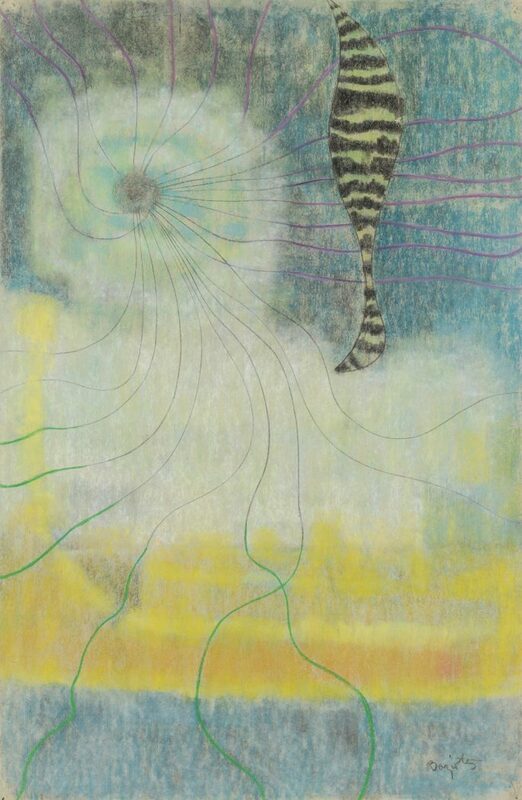 Baziotes may have kept to more earthly titles, but the ethereal colors and flowing lines of paintings like Sea Forms convey a similar sense of creative energy emanating from some germ of life. A Klee quotation on the section label reads, “Art does not reproduce the visible, but makes visible.” We learn that the artist was inspired by the “parallels between the growth of a seed and that of a picture, or the common principles that align natural and artistic creation.” Likewise, the works in this section do not merely represent forms from nature, but also evoke natural processes of creation. In this way, they are linked to those in other sections that explore and value process over product, like the practice of pictorial writing, of visually representing musical patterns, or of generating a symbolic language. In fact, some works in these other areas, such as Gene Davis’s Black Flowers, Baziotes’s The Falcon, or Klee’s Tree Nursery might just as easily have fit here. So, when you enter the galleries at the Phillips as a visitor—both those of the permanent collection and the special exhibitions—do so with the confidence that there is no one “right” way to experience the art. Take a look around wherever you find yourself, and see what connections you perceive among the works. Feel what they evoke for you in that arrangement. The labels will give you guidance and there is always more to learn, but let the art as it is exhibited invite you into the “conversation” and your experience will be more personal—and a little bit different every time. William Baziotes, who studied objects at the American Museum of Natural History in New York, developed an interest in rendering the underwater world. Like Paul Klee, Baziotes strove to become one with nature by penetrating the mysteries of the world that lay hidden beneath the surface. Indeed, because of their close affinities, works by the two artists were shown together in several exhibitions throughout the 1940s and 50s.